Korea has been at the forefront of the news over the past couple of weeks as violence has begun to escalate between the North and the South following a North Korean shelling of the South Korean island Yeonpyeong in response to a series of planned military exercises. The escalation of violence seems to have been rising, when an attack on a South Korean warship left almost fifty sailors dead. Indeed, the two countries seem to be a rapidly drying powder keg with a new South Korean leader, and with the expected promotion of Kim-Jong Il's son, Kim Jong-un at some point in the near future. With almost 30,000 American soldiers just to the south of the 38th parallel, an outbreak of war in the country is something that will heavily impact the United States. With two major conflicts on their way out the door, the prospect of another confrontation abroad is a sobering one. In 1952, Dwight Eisenhower became the 34rd President of the United States, where he had campaigned on countering Communism, Korea and Corruption. Despite leading the Allied military against Adolph Hitler and his allies in Europe, Eisenhower sought to bring down the national budget on a platform of fiscal conservatism, bringing about deep cuts in the military budget and recognizing a new philosophy and approach to the United State's presence in the world. After visiting Korea, Eisenhower sought to bring the United States and its efforts to an end, and with a cease-fire (although no resolution) to the conflict, was able to fill a major campaign goal that aligned with his beliefs: the United States did not, and could not fight in every battle across the world with a massive standing army, able to engage in more conflicts such as the one just waged in Korea. Under his 'New Look' plan, approved in 1953, which allowed the U.S. to utilize technology and America's atomic stockpile as a means to deter open aggression from the Soviet Union from directly attacking the U.S.. The policy was designed to rein in defense budget spending on a massive conventional force, while spending less on a more technologically oriented one that wasn't necessarily required to do anything but exist. The recent troubles in Korea bring to mind some of the issues that have been ongoing in the political and military scenes recently. As the country begins to move in the direction of less spending (at least the attitude is there, somewhat), reducing the fiscal situation of the United States will require something along the lines of what Eisenhower had envisioned for the country half a century ago: reductions on all fronts, including military spending. The policies that were put into place were engineered with the fear that the country's financial footing had a corresponding impact on the nation's national security standing in the world. America, with a growing economy, population and budget, could face major problems as it was, and potentially, with the added need of continual fighting abroad in conflicts that were similar to Korea, the country’s stability could be at risk. In a large way, the series of conflicts that followed September 11th fall right into what Eisenhower feared for the country: exceedingly high defense budgets for an expensive war where the United States has gotten its hands dirty in areas perceived to threaten the country’s security. Eisenhower had pushed against full American engagement in Vietnam, and it wasn’t until after his term in office that the conflict escalated for several Administrations, from which point the U.S. was able to stay out of major engagements until 1991, for Operations Desert Shield and Storm. Here, the theory of technological warfare as a superior form of conventional warfare was validated: for the 372 coalition soldiers killed as a result of the conflict, around 30,000 enemy soldiers were killed. The fight in Afghanistan and Iraq are different: the U.S. has been slow to adapt to the new environment of warfare, plunging in with certain assumptions and coming out with an entirely different experience than was expected. Continual fighting in small conflicts will cause further problems for the country, especially if such conflicts are not properly understood and the ways in which to fight them are imperfectly realized. The Eisenhower administration’s plans to deter fighting against the country worked, in part. The threat of massive retaliation faced its biggest test in October of 1962 during the Cuban Missile Crisis, and demonstrated that the threat of assured destruction of both countries (not to mention everyone else caught in the crossfire and were downwind) was enough to force both players back down. At the same time, it hasn’t been able to prevent warfare outright: Vietnam was a war in which the nuclear issue was largely side-stepped, and would cause problems years down the road, while American involvement in areas such as Haiti, Panama, Somalia and other smaller countries and conflicts have not been decreased, although their significance doesn’t approach the scale of something like the current fights in Iraq and Afghanistan. The Iraq and Afghanistan wars are both abnormal conflicts, and two fights that signal some frightening precedents for the future. Already into its 9th year, the combined conflicts have cost an estimated $1.1 trillion, for a conflict that seems to run counter to the vision that Eisenhower had hoped for and seems to have done precisely what Eisenhower feared such battles would do to the country’s financial status. In the future, what conflicts does the United States have in store, if it can enter into a war-like state whenever it sees reason to do so? The prospect of renewed war in Korea only adds to the fears of a continued lack of restraint when it comes to spending. Political elements in the United States have called for fiscal restraint, but the exception seems to be the money that pours in for the military. 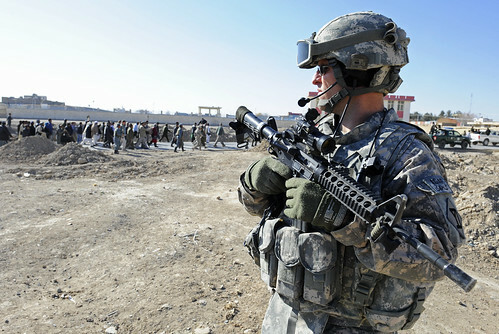 While the front-line soldiers need the financial support in order to accomplish the mission in front of them, the country needs to adopt a mindset of reducing the need for the soldiers to be requiring that money in the first place: avoiding costly confrontation across the world by recognizing which conflicts should be fought. The practice of deterrence will likely not work in this new environment of war: multinational political groups are harder to deter. Deterrence in Eisenhower’s day was the best means to contain spending and effectively protect the country from those who wished harm against the country. In the present day, we need to do much the same: figure out the best way to defend the country without oversight and restraint. Should the tensions between North and South Korea break, the United States will likely have some hand in the issue, and we could find outselves in a third major conflict at a time when we can't afford to become entangled.